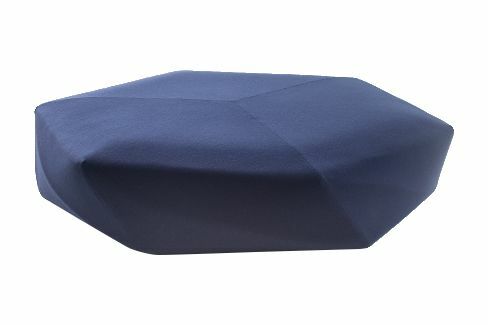 Designed originally for the new Issey Miyake flagship store in Brook Street in the heart of London’s Mayfair, Brook is an upholstered ottoman with a faceted profile where the cuts, designed as a function of the textile covers, bring to mind precious stones. In the seats however there is no refraction, no light. The name, as well as referring to the address of the London store, suggests the image of a brook evoking the idea of a river stone, moulded and shaped by the action of the water. A refined symmetry derived from observation of nature and the integration of its laws in the very act of designing. Injected flame-retardant polyurethane foam over internal steel frame; on clear PVC glides. Fabric covers only; not produced in leather. Brook covers are removable.